A Behind the Screens look at the collaboration between artists Eli Rezkallah and Signe Pierce for Marzook’s FW18 collection. The series of images was inspired by the futuristic shapes, colors, and textures expressed in Marzook’s new line of handbags. The artist’s chose to merge classic iconography from art history’s past to inform the fantastical world of their imagined Girl of the Future, creating a tongue-in-cheek look at who she is, what she represents, and what she cautions. …The Myth of Narcissus, a cautionary tale straddling the nature of self vs. selfie; person vs. persona. …Devotional Shrines, dedicated to worshipping the phenomena of the feminine within the scope of new media. 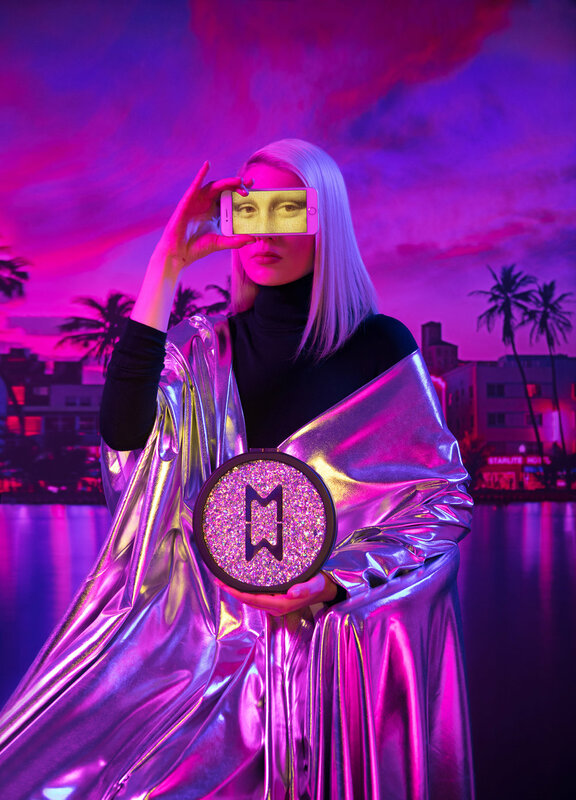 …A Neon Mona Lisa with a digital gaze and a photoshopped consciousness. She lives her life surrounded by screens, be it gazing at them, inside of them, or both at the same time, examining what it means to exist between digital and physical realities; straddling the virtual and the real.